Peter Paglia has been a resident of Annapolis, Maryland for 30 years. He is married to Ludia and together they have three boys, the youngest of whom is 15 years old. 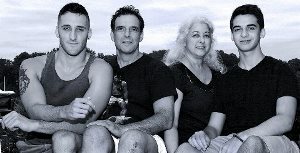 (Pictured here are Peter and Ludia in the center, with son Justin on the left and son Jacob on the right.) A master Cabinetmaker and Luthier for 30+ years, Peter is regretfully working a very limited amount due to his declining health. Peter has been a real blessing to his community, family, and friends. Two years ago, Peter closed his cabinetry shop, took a job and had a hernia checked out shortly thereafter. It turned out that the hernia was not the real concernâ€¦liver cancer was. He was fortunate to be placed on the transplant list about six months ago (October of 2013). A liver transplant is now his only chance of survival. Peter and Ludia have come to realize that funding this surgery is a monumental task, as there are so many uninsured transplant related expenses, including relocation to Philadelphia during the time of transplant and very expensive lifelong anti-rejection medications. In order to ease the financial burden, a fundraising campaign in Peterâ€™s honor has been established with HelpHOPELive, a nonprofit organization that has been assisting the transplant community for 30 years. Donations are tax-deductible, are held by HelpHOPELive in the Mid-Atlantic Liver Transplant Fund, and are administered for transplant-related expenses only. Please consider a contribution. I realized the other day that I write when I’m stressed. I suppose that its helpful to share with others at that point in time. I wrote a little update on Thursday, October 30th as Peter was in another anesthetic procedure called an E.R.C.P. Basically, the bile ducts connectiing Peter to the new liver are tight and blocked. This likely contributes to Peter being itchy, tired and who know what else? The procedure went well and then… well… let’s see what the labs may bring… Thank you all so, so much for your love and support! What is there to say that might be new? Well, … Peters liver numbers continue to change – each in their own respective ups and downs. Some directions are great and other directions require more tweaking of meds. Tubes and staples are out. Now more healing can happen. I can’t wait for another scan of his liver, where they say that its fully regenerated. That’ll be an interesting day! Meeting up with Dominic and Donald (his Dad), here for his follow up visit. It will be nice to see them! Next clinic will be next week. More updates then, if not before! Trying different routines with medications, to see what will work best for life outside of TH. Walking and eating high, quality proteins are very healing for Peter. We are learning alot about nutrition and life with immunosuppression. We will be in a bit of a bubble for a time. Things will get easier in that regard, so we are told. We have graduated to the next step down! So relieved and a teeny bit nervous. From being cared for 24/7 to alot of education and doing alot on our own. He has some pink tinges to his skin that I haven’t seen in years. This is a good sign! So, so grateful for this experience! Much love! Will post more later! Great News! Turns out that Peters new liver is now trending out of rejection mode! Wow, and what a relief. Looks like a couple more days in Critical Care. Thanks so much for your love and caring. This has been an incredible experience. We got good news last week! Surgery is scheduled for Living Donor Transplant on May 20th! Things just got real very quickly! We have had lots and lots of blessings around this diagnosis and this fundraising is another aspect of them. Thank you so, so much for all of your love and support! We will keep you posted! To help achieve our fundraising goals, a benefit event in being planned in Peter’s honor. If you are interested in putting your time or talents to this worthy cause, please contact us at our home, 410-956-6791.